Season Six features a diverse line-up of Asian films, with Japan, South Korea, Taiwan, China, India and Hong Kong all represented for the Spring of 2018, all with English subtitles (also Canada and France are listed producers). Screenings occur at the AMC River East 21 in downtown Chicago, with other various locations for special events and a number of free screenings (link to details below). HollywoodChicago.com sat down with Sophia Wong Boccio for a preview of Season Six of APUC, and the always energetic and passionate Ms. Wong Boccio had an amazing perspective on worldwide Asian cinema, and her contribution to the Chicago scene. HollywoodChicago.com: What are looking forward to most as the sixth season of Asian Pop-Up Cinema is about to begin? I also have a new initiative this season with the Canadian consulate, and the series is picking up three films co-produced through a collaboration between China and Canada. One documentary [“The Magical Life of Long Tack Sam”] is from Canadian filmmaker Ann Marie Fleming, who is the great-granddaughter of the film’s subject… the first Chinese magician ever to play on Broadway. Fleming is a graphic artist, and film has a unique and nostalgic look to it, and it’s part of the kaleidoscope of Chinese/Canadian co-productions. 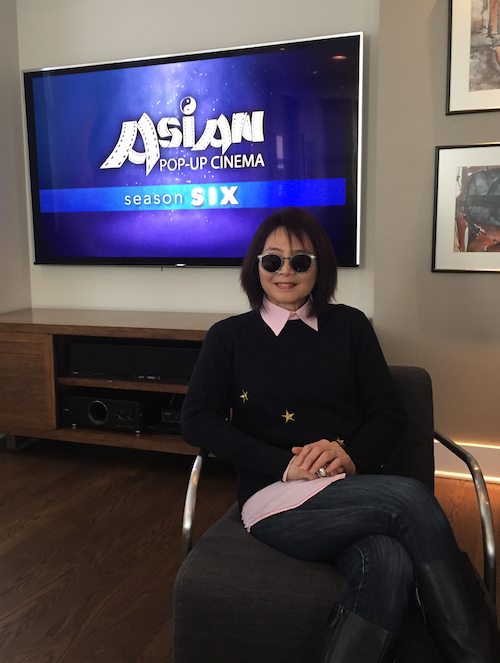 In the audio portion of the interview, Sophia Wong Boccio talks about what the Asian Pop-Up Cinema series has contributed to Chicago, and her perspective on individual countries and filmmakers, including her mother YU Wan-Fei, who was an actress in Hong Kong cinema, and who recently passed away. Season Six of the Asian Pop-Up Cinema series opens with the U.S. premiere of “Colors of Wind” on Tuesday, March 13th, 2018 (7pm) at the AMC River East 21, 322 East Illinois, Chicago. For the complete overview and schedule of the Asian Pop-Up Cinema series for Season Six, click here.